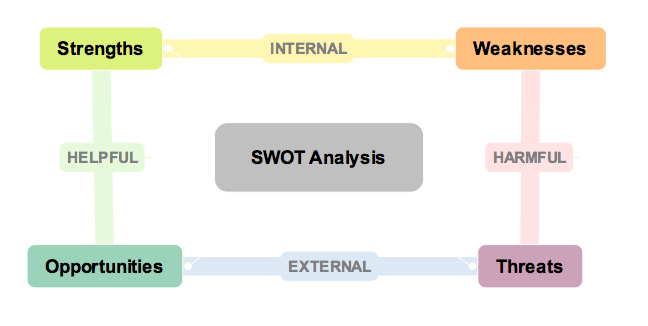 I stumbled onto this SWOT Analysis diagram in Mindjet and thought it was provocative in its simplicity. This particular graph categorizes strengths and weaknesses as internal characteristics while opportunities and threats are considered external characteristics. However, can not each set of characteristics also be seen from the other’s perspective i.e,. strengths and weaknesses as external characteristics and opportunities and threats as internal? In either case, its been my experience the opposing characteristics are ultimately degrees removed from the same characteristic. This entry was posted on July 13, 2010 at 1:58 pm and is filed under SWOT Analysis Diagram. You can follow any responses to this entry through the RSS 2.0 feed. You can leave a response, or trackback from your own site.